Christian Bautista also shares that he and his wife are already planning to have a baby next year. A little over five months since tying the knot with Kat Ramnani, Christian Bautista opened up about the things he has encountered in their marriage so far—including how his perspective as an artist changed when he became a married man. “My understanding of love became deeper. A marriage kasi is not a contract. It is a commitment talaga. And when I sing love songs now parang it has a deeper sense or deeper meaning to me. And at the same time, when I sing breakup songs mas masakit kasi parang ‘awww’ what if this happens to any married couple? This is going to be tough,” he said in an interview with the press after his renewal of contract with Universal Records. Bautista then cited Yeng Constantino as an inspiration who released great songs about love, but eventually decided to release painful songs even though her marriage is at its best. “Si Yeng nga ‘di ba when she got married, nag-release ng ‘Ikaw’—so famous all over. And then iniisip ko will she be singing breakup songs as well? Ngayon parang kumakanta na siya eh. So parang mga breakup songs na rin. So at the end of the day, she’s a great artist and whatever she sings become hits. So now, being married, when I sing love songs of course mas may meaning and when I sing breakup songs, mas masakit ‘yung lumalabas,” he stated. While he admittedly feels inspired to write songs after his marriage, he simply couldn’t dismiss the fact that being passionate about one’s craft should always be at an all-time high. “‘Yung now more than ever, ayokong sabihin. Kasi dapat palagi kang driven to write every year. Siguro minsan nabuburn-out ka, siguro minsan parang ayaw mo na, siguro minsan walang pumapasok - writer’s block. Parang where’s the inspiration for weeks, for months - wala. Then you, ask. You collaborate. Parang I need help here. Let’s collaborate, give me ideas. Or you travel or you search yourself. You search the past. Whatever it is basta kailangan may pumasok na inspiration to write again. Pero you should not stop,” he said. But Bautista did not deny the fact that he and his wife have had a couple of arguments already. “It’s been a few months pa lang. It’s been a wonderful ride so far. Of course, merong days na okay, merong days na may arguments ganyan. Pero at the end of the day, if you do love each other, and if you fight for each other, and if you really do your best to commit and love each other, I think kahit ano pwede niyong [lagpasan],” he said. While some corporate individuals who end up marrying someone from the entertainment business become a challenge due to time constraints, Christian Bautista said it is not the case for them as he gets to enjoy the best of worlds. “In terms of entertainment business and corporate business, you know what, I like it. Kasi, I also learned so much from her. We think that the entertainment business is big, but we’re really small. Alam mo ‘yun? Mas malaki ang corporate. We are also a corporation. It just seems big kasi we broadcast it everywhere. Pero I learned a lot from her as well and I applied it to my life—structures, schedules, details,” he shared. “On my end naman parang I help with creativity or I help with creating different ideas and strategies ganyan. So nagtutulungan kami with that. Ang mahirap lang is ang trabaho ko usually weekends, tapos siya free weekends. So paano namin maaayos ‘yung the time, right? So minsan I have to block off yung weekends para talagang makasama ko siya. Kasi hindi ko pwedeng sabihin ‘Sorry ito ‘yung buhay ko ha?’ ‘di pwede talaga kasi at the same time, hindi niya rin pwedeng sabihin na ‘This is me kailangan mag-adjust ka.’ So really, an adjustment for both,” he added. Set to have their honeymoon by the end of the year, Bautista revealed that he and Ramnani are already planning to have a baby next year. “We’ll see, of course. It’s just a plan. If it’s God’s will, dadating,” he said. 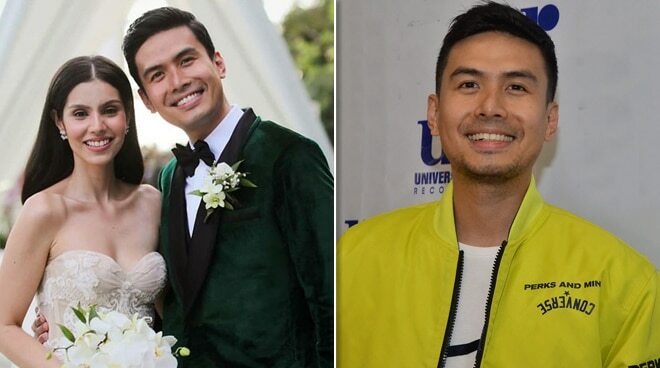 Christian Bautista and Kat Ramnani tied the knot back in November 2018. Meanwhile, Christian Bautista has a new single called “Aking Mahal” under Universal Records. He will be releasing more songs in the coming days.